posts of Probationary Officers. Under this, Indian Bank Manipal School of Banking (IBMSB) will hold one year post-graduate diploma course in Banking and Finance (PGDBF) for selected candidates. 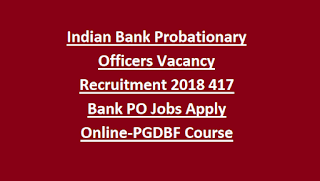 Application procedures for this Indian Bank PO Jobs have begun from 01-08-2018. Interested and qualified candidates can apply online through Indian Bank's official website at indianbank.in. After completion of one year course, candidates will get posting in different branches of Indian Bank as Probationary Officer. Last date to apply online through IndianBank.in is 27-08-2018. 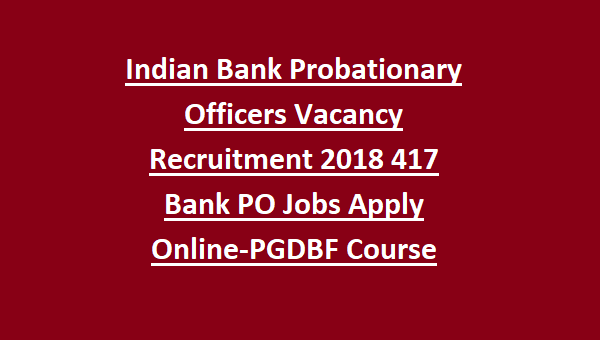 Qualification, Exam Pattern, How to apply, available vacancies and other details are given below for this PO jobs of Indian Bank Recruitment 2018. Graduate from a recognized university or institute. Minimum 20 years and maximum age is 30 years. 5 years for SC/ST and 3 years for OBC candidates age relaxation is given. On the basis Prelims and mains examination, interview candidates will be selected for this PO jobs of Indian Bank. Preliminary Exam will be held for 100 marks. Total 100 questions will be given. Exam duration is one hour. For this Indian Bank PO jobs Mains Exam consist of two sections. 1. Online Test-Main Exam duration is 3 hours. Total 155 questions will be given. 2 - Click 'Careers' on the homepage there. 3 - Click on 'Apply online for PO on Boarding'. 4 - Register yourself first. 5 - Fill in the full details and click Save. 7- Fill out the application form with the necessary information, submit online fees and complete the application process. 8 - Download the confirmation page and take the printout.